The moment you’ve all been waiting for has finally arrived! Muv-Luv and Muv-Luv Alternative are relaunched on Steam! Sekai Project says: "Hello Muv-Luv Trilogy PC Backers and Steam Users!" Thanks to Sekai Project for helping us relaunch the games sooner, with the best comeback ideas possible! What's new* in the relaunch version? 1. Updated scripts for Muv-Luv Alternative- There will be one more final text update, but this won’t affect the save data at all, so feel free to progress with the story. Help spread the Luv to your friends and family by sharing our social media posts! *The new Steam cards, and backgrounds will be implemented after the release. We were rushing to relaunch the games so we weren’t able to finish all graphical assets in time. Rest assured we’ll update everyone here on Kickstarter, social media, and Steam once they’re available. Please look forward to it! The Director’s Cut Patch is back on Denpasoft! Also, the Director's Cut patch for Muv-Luv is available once again on Denpasoft store, and only for $4.99! The existing patch still works with the new version of Muv-Luv! Just be sure to uninstall the old version first before applying the patch. If you encounter any issues, be sure to let us know so we can help you. I already own the game(s), how to get the new key(s)? For Backers - New keys for Muv-Luv and Muv-Luv Alternative were added to BackerKit. Please check your pledge details and browse the "Digital Downloads" section. For Steam Users who owns the original AppID(s) - Valve support said they’re currently looking for ways so the original AppID owners can also get the new versions. If we can’t solve the problem before the end of March, we’ll be using Steam API to fix the issue. How to transfer the previous save data? Copy the original AppID save folders somewhere as backup. Install the new versions of Muv-Luv and Muv-Luv Alternative. Run the game once, and open all save slots. To do this, at the very beginning of the game, just simply click save and fill up every single save slot with the same scene to “unlock” them. Once all save slots are occupied, close the game and turn off Steam Cloud sync, located under Steam “Properties”→”Updates”→.then unchecking “Enable Steam Cloud synchronization”. Copy the previous Muv-Luv save folder over to the new version's local directory located inside "steamapps/common" folder. Turn Steam Cloud sync on once again, and all original save data should be transferred to the new version. Credits to Gabgrave, The Muv-Luv Team's passionate localization team leader for figuring out the solution! That's all for now. if you have missed out on the physical rewards update, please check Update #49. Please look forward to even more sweet updates in the coming months! Jonathan Robertson, cabfe, and 22 more people like this update. Ok. I completed Extra and Unlimited, the patch worked. I have an issue. I fully completed all the routes and endings (and the clear list is 146/146) but there is still a Steam Achievement that is not unlocked. I know what it is (since I completed Degica's release too) but whatever I do, it just keeps locked. As for the Alternative patch... well, I do agree that we have to get it, mostly because it was offered. Originally I was waiting for the patch, but in the end I knew what was patched and to be honest Alternative works as a story without it... some even might consider the all ages version of some scene better. I do recommend reading the all ages version first and then check those scenes later, when we get the patch. The new patch worked for me. Thanks a lot. Looking forward to future updates. I still have some routes to do in unlimted and extra, so I guess I'll do that. Plus other VNs I want to play, so there is that. I really do want to play alternative, but not until it is in its complete form. @Dac: I agree. I'm waiting for the "complete" version of Alternative before I start reading it. So if Photon comes first, it'll also wait until after I read Alternative, and it'll become a long time this way. I don't understand why your priority is not to finish work on Alternative, which was what this kickstarter was for, and instead work on what is a stretch goal. Whatever, hopefully you can get it done by this year. Thanks Muv-Luv Team! Everything's working perfectly. We've resolved the Error 86 issue. You can download the new Director's Cut patch on BackerKit which works with the relaunch version of Muv-Luv. Backers can choose to download the 2018 patch on BackerKit, or use the 100% discount code on Denpasoft and download it for free! Regarding Muv-Luv Alternative patch : As we've said before, we'll be doing the Director's Cut patch for Muv-Luv Alternative eventually as it was a promise made during the campaign. @Zachary Schmitt : From this update "The new Steam cards, and backgrounds will be implemented after the release." So, yes, they're coming soon. Any chance of getting trading cards for the new version, as well as alternative? Trying to get the DC patch to work. Same issue with everyone, Error Code 86. After verifying the patch, the gallery just shows the All Ages version of the scenes. Can we get word on the DC for Alternative? The first DC came out pretty much right away, I don't understand why this one isnt being treated the same. I have the same issue with the director's patch as everyone else is reporting (error code 86). I don't really care to hassle with moving my saves over since I wasn't very far anyway and don't mind starting over, but I do want a working DC patch. I would also like news on a DC patch for Muv-Luv Alternative. I don't know if this is really a fix, I doubt it is, but I figured a way to get the old saves working, but now the error message does the opposite with the dummy (newer) saves made during the update. 1) Verify the integrity of game files to get the 'updated' Steam version of the 'muvluv16.exe' executable. It should be 2,760KB in size. 9) Muvluv should now run under Steam and you can load your old game saves. "Warning: This save was made in another version. Loading this save can result in an error or a state where the game can not be completed. Do you wish to load this save?" Loading these dummy save game seems to work, but again, I do not know if this is really a fix. It may just be a lengthy way of reverting back to the pre-update/DC-patched version since the 'new' ruo1 file is being replaced with the older, DC patched file. I really can't tell, but at least it's apparently able to load the old saves. Perhaps someone who's already completed the entire game(s) can chime in with the saves, extras, etc.. I've also been getting that error code 86 thing... maybe there needs to be an updated patch? Since the patch replaces the EXE and the appID has changed? Same here with the error, but that's not really fixing it, it's reverting back to pre-director's cut patch. Any idea why this is happening? I hadn't played yet and only had the one first scene save in order to follow along with the directions. I used my original patch from before and also redownloaded, same error 86. Please investigate. It was pretty obvious they were going to work with SP after Degica was gonne. 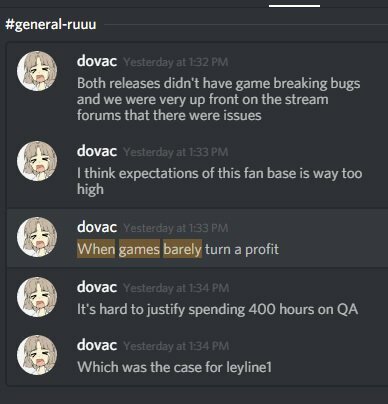 Leaving the problems with Sekai project's translations and their boss shitting on everyone, I did have some problems with previous SP's KS, so I hope their work in the future would be limited to dealing with the steam publishing. Sensuifu: I tried patching before I restored my saves and after and it didn't work either way if that's what you mean. I did a full run with skip for Alternative since I completed the previous version (later I'll check some parts I remember were wrong, now I can check individual chapters). I'll also test the saves. Brad, I ran into the same problem with the old saves. I thought it was working, but loading them up shows the error between the two versions. Looks like verifying the integrity only overwrites the patched executable with the steam/unpatched version. Wondering if skipping the save step in this update has any effect. Chris Adamson: Wow, I didn't even try to load my old saves, scatterbrained I guess. I have the same issue as you, it says that the saves were made with a more recent version of the game and wont load any of them. I guess we really need that patch to work. Sensuifu: That's what I had to do too. Since those saves were made in the Director's Patch version of the game which isn't working now I wonder what will happen with the gallery CGs. If you view them now they are the all ages versions, I wonder if reapplying the patch when it is working again will fix the unlocked CGs. Brad: I just did the "verify integrity of game files" approach on ML and it said it had to re-download a file, but once I did, the game runs again. However, with some saves it shows the windows dialog about "this save was made in a different version". Other saves show the "you need to apply the patch" error, which makes me wonder if the re-downloaded file that fixes the integrity problem just un-did the patch. Lots of problems with Alt. Can't save empty saves past slot 73 (though I don't think I ever used that many), and a problem when closing the game "Current play data cannot be written to disk". Got it working now. The old save games that were saved under the 449830 folder have to be copied into the new version's folder 802880. The original directions may not work for some. Thankfully I backed up my saves, though I wish the update wasn't so confusing. Daniel & Sensuifu: I got my patch from backerkit. I also fixed the game by verifying integrity of game files but luckily I didn't lose any saves. I did test to see if the patch had worked anyway and it hadn't, which I didn't expect. If we lost the original patch we got for backing do we need to pay for it or will our old code work? I got the "error code 86" message, but was able to fix it by clicking 'verify integrity of game files' under the 'local files' tab under properties. Brad, Chris, I got the same error. I also contacted support. You guys got the patch from backerit or the Denpa one? Chris Adamson: I had the exact same issue and sent an e-mail to Tanaka. At least I'm not the only one. I won't touch anything Sekai is involved with anymore. After the train wreck that was Hoshimemo, they apparently can't even be trusted to produce a TL that's consistently better than a JP -> CHN -> EN one that's chock full of inaccuracies and memes. It's extremely disappointing that you're partnering with Sekai. If they have any role in any of your upcoming projects, kiss my money goodbye. Migration worked, but on Mul-Luv you have an warning message that save is from another version and thumbnail does not work. Alternative works witouth any issue. FWIW, applying the director's cut patch broke my copy of Muv-Luv — "error code 86", https://imgur.com/Nu6FjRy — so I had to uninstall and re-download. If anyone has better luck, please post what you did. In the folder described in that post, "449830" is Muv-Luv. The "vmrXXXXX.uuc" files are Muv-Luv saves, and I *think* the folder "_alt16" are the Muv-Luv Alternative saves (the file dates look right to me). I'm midway through this process myself. Hope it works. where are located the saves? Esker: that was explained back in update #47, https://www.kickstarter.com/projects/muvluv/muv-luv-a-pretty-sweet-visual-novel-series/posts/2100828 . ixtl took the project back from Degica, but Degica couldn't / wouldn't / didn't know how to transfer the AppIds, so ixtl's release (via Sekai project) needs to be a new AppId. Why are these completely separate AppIDs instead of this just being a patch? Sekai Project? Really? What the hell were you thinking? Well. I understand while some people does not like Sekai Project, but in the other hand, this is mostly translated, the translation team is assembled... and like it or not Sekai Project is an already established and known company in the west. Sadly the old forums are gone, I can't really remember all the reported translation problems for Alternative. Has there been a repack? The sizes indicated by Steam for the previous versions and the new ones don't match. About 200 MB less each time. Will the old directors cut patches from the backer kit work with the new version or do we have to pay $5? Should I contact support in regards to refunding my pledge or is there another branch to contact? I have 0 interest in supporting ANYTHING that Sekai Project has their hands on. I'm amazed you guys even considered partnering with Sekai Project considering all the horrible releases they've done lately and I don't want to support their atrocious business practices. I've waited nearly 3 years for physical goods AND Alternative still hasn't been finished (no restoration patch) and now you're telling me I'm going to have to deal with Sekai Project? No thanks. I've seen how the company's Ex-CEO mocked people for complaining about all the typos and untranslated text their company has in released titles and how little they care about us since we're "Not the targeted demographic they're selling to". I'd really like to avoid the 6 month long Chargeback associated with issuing one but at this point It's a far better alternative than needing to deal Sekai Project. I didn't pledge to support Sekai Project. I'm done, I'm out. Can we please get word on a director's cut patch for Alternative? Bruxae: Go to https://muv-luv-a-pretty-sweet-visual-novel-series.backerkit.com/backer/digital_rewards and (if necessary) log in. Scroll to the bottom where it says "Muv-Luv 2018 Steam Key (Bundle)" and "Muv-Luv Alternative 2018 Steam Key (Bundle)"
So.. How do I find my backerkit link? I'm going through these steps now and I'm not completely confident of the order. You may want to back up game data from C:\Program Files\Steam\common\muvluv first, before uninstalling the old version, because that folder is gone now that I've uninstalled. Then again, if the sync works, I guess it shouldn't matter. I'm sure others will chime in here once they complete the migration successfully. Glad to hear this is sorted out... it sounded like something of a mess. It was a bit of a hassle to find the backerkit link again.